On 23 September the society invites its members to an interesting lecture by Sjoerd de Vries about Southeast Asian buddhist art. In the northeast of India, in the modern states of Bihar and Bengal, large buddhist centres such as Nalanda and Vikramashila emerged in the 7th-10th centuries during the reigns of the kings of the Pala dynasty: enormous temple structures with accompanying religious universities, where students from the entire buddhist world came to study. From these centres buddhism spread to the region of Southeast-Asia: in Birma we see this influence in the art of Pagan; in Thailand, in the important reign of the Khmer; and very clearly in the art of Indonesia from the 8th until the 12th century. These influences also spread to the north: to Nepal and later to Tibet as well. 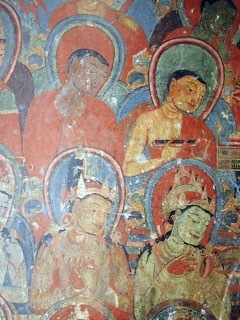 Other important buddhist centres at the time were in the northwest of India and the Swat valley. Both regions influenced Tibetan buddhism, that flourished again at the end of the 10th-11th century, in writing as well as in art. It is interesting to look at these influences and to show how they remain important in the centuries that follow. Sjoerd de Vries (1952) is art historian, specialised in Central Asia and Tibet. He is the owner of art dealers Astamangala in Amsterdam, specialised in antique Tibetan art. He also publishes articles in his field.